We’re Going To The White House!!! Kickin’ it with Ronald McDonald at the White House Easter Egg Roll in ’81. Pops got me all messed up with the brown cords and the tight maroon jacket. Yep… that’s right. Uncle G. Mo is taking the nieces to 1600 Pennsylvania Ave for the annual White House Easter Egg Roll. If you recall, that is the residence of President Barack Obama and family. I haven’t told the girls yet, but best believe that they’ll be excited when I inform them. Now most folks are aware that I’ve got hook-ups from here to Timbuktu, but when it came to copping these tickets, bruh man had to do work. I sat in my office logged onto the White House website for hours. Every 5 minutes or so I’d hit F5 on the 3 different browsers I had open. For the first 3 hrs of trying I got nothing but the “Thank you for your patience” message screen. Around 2:15pm, I had 6 tickets selected once and then got booted. About 10 minutes later I was able to get back on and it went through for the 6 tickets that time. Presto!!! I was in. My hands started shaking like I had arthritis as I tried to type the pertinent info into the blanks. The excitement of actually getting through the system was what shocked me. I mean, I always believe that I’m going to get whatever I want. But sometimes I end up on the short end of the stick. This time, I got lucky. Seriously, I can’t even say it was anything more than that. I didn’t get a chance to take the girls to the Inauguration and I was kinda sad about that. So I really wanted to find a way to get them to the White House. This coup today, sealed the deal. Back in the early 80’s when Ronald Reagan was President, my dad used to take me to the White House. I remember those days like they happened yesterday. I didn’t care about Democrats and Republicans back then. I just had fun on the lawn with the rest of the kids, the cartoon characters and playing games. That is one experience that I want my own child to have one day as well. But for now, I’ve got 3 little girls who call me uncle who will be happy to go. Hopefully they’ll get souvenirs like I did back in those days. I still have my wooden eggs from ’81 & ’82. It’s amazing to think I actually kept them that long. As much as I’ve talked to them about President Obama and the interest that they’ve shown in him being President, it will be historical for not just them… but me too. Hell, I might be just as excited as they’ll be when I tell em. Best believe that I’ll be taking plenty of pics of our day. A brotha was preparing the after work meal at the crib and grabs a box of Zatarain’s Yellow Rice as he does on the regular. The directions are quite simple that even a child in kindergarten can figure it out. But on this occasion, things were quite different. One think struck me instantly when the packet in the box was opened. 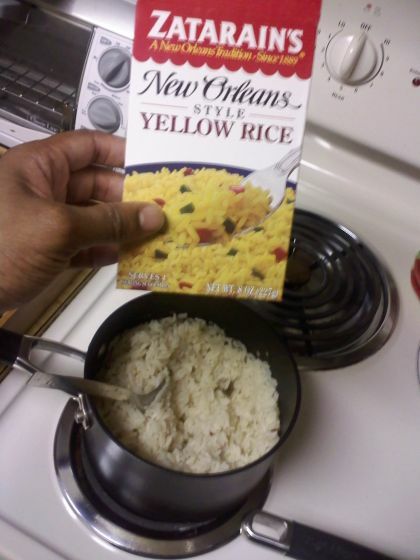 The yellow rice wasn’t yellow, it was white. Now, I’m hold “Hold up, what happened to the yellow rice?” They done pulled a switcheroo on me. So I went ahead and cooked as usual and it was aiiight… for white rice. But I bought the yellow for a reason. I wanted yellow. So best believe that I got on the phone with the Zatarain’s Consumer Affairs dept and let them know the deal. The lady I spoke with was very polite and apologetic. She stated that they’d send me some free coupons as an olive branch for the inconvenience. 48 hrs later, I had my letter and the coupons. I try to tell folks that writing letters and contacting customer care departments about issues that occur are a necessity. I have a file of letters I’ve written for the past 15 years with hard copies as well as on the computer. Ask Pentagon City Mall what happened when I saw a roach in their food court while dining one Saturday afternoon in ’94. How about the letter I wrote to Subway corporate 2 yrs ago when I went to get a sandwich at 8:45 and the clowns who were hired to do their jobs til 9pm had closed the doors 15 minutes early and refused to open them as I stood outside patiently for 10 minutes. I contacted General Mills about 10 yrs ago when my Honey Nut Cheerios box had regular Cheerios inside. Let me not forget Comcast HQ in Philly 4 yrs ago when a tech just totally messed up my install. Now their execs send me Christmas cards each year. Want something done? Write a letter or voice your issues with the companies who have ‘wronged’ you. Screaming, fussing and cursing don’t get you anywhere or the issues resolved in most cases. Patience and a calm attitude will get better responses when things happen. Just remember that. You can thank Mr. Terrell Owens for inspiring my latest creation. A web page, soon to be website with the domain name I Beat To My Own Beat Dot Com. Yeah, I had a little bit too much time on my hands last night and what!!!??? I thought about that stupid phrase for 3 days and the bright light came on when I was driving home that I might be able to register it. Did you think for a sec that I wasn’t gonna scoop up the domain name off GoDaddy? I’mma full time hustler and on the grind regularly. Gotta find ways to make that cake. Maybe I’ll put some effort into the site. Maybe I’ll add some guest writers and columns and what not. Who knows. Buffalo Bills fans if you’re out there, hit me up. Folks who got $$$ who want the domain, hit me up. I’m out.